Welcome to Sunday, PMB friends! Ryann here with a very CAS (Clean & Simple) card. 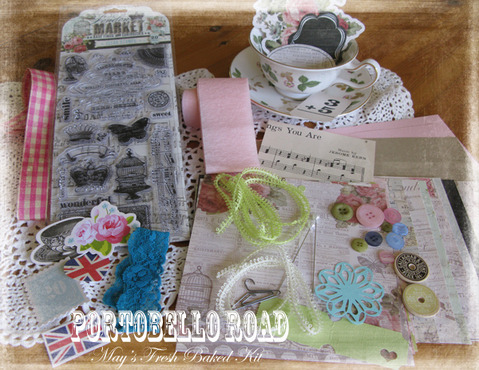 This card is ALL about the embellishments found in the Portobello Road kit! I've used some of the PMB custom die cuts along with Pink Paislee and Maya Road embellishments to create the focal point of my card. I added some buttons and the sentiment completes the card. This card took me all of about 15 minutes to put together (almost unheard of for me!!) and it would be very easy to duplicate or produce multiples of if you needed that many. You can see the full listing of the Portobello Road contents and pick up yours HERE! Have a great day and we'll see you again tomorrow with more Paper Made Bakery inspiration!! very pretty...love all the fun detail.. This is BEAUTIFUL!!! I loveeeeeeee the hanger and the little buttons!! OHHH! I LOVE this! LOVE the little hanger! FUN!